Extensive diet information was collected at baseline in subsamples of generally 20 to 50 men in all 16 cohorts. Duplicates of the amounts of foods as eaten at home during a week were weighed, prepared for shipping for central laboratory chemical analysis of fatty acids, nitrogen, and ash. See also cross-cultural correlations. Only in the Zutphen cohort were baseline and subsequent diet questionnaires administered to all participants. In Finland and Italy incidentally information on diet was collected of all participants. Read more about the dietary surveys in the Zutphen study. A great effort was made to standardize questionnaires on demographic and lifestyle factors, anthropometric, biochemical and biophysical measurements, and clinical diagnoses. Almost all principal investigators have been trained at the Laboratory of Physiological Hygiëne of the University of Minnesota. Moreover, two members of the central staff (Henry Blackburn and Alessandro Menotti) teached local collaborators before the start of each field examination and supervised the operations on the spot. Whenever possible procedures were centralized such as coding of questionnaires, measuring blood pressure and serum cholesterol, reading spirometric charts and ECGs, assessing diagnostic conclusions of prevalent and incident diseases and coding causes of death. Re-examination of all survivors was made after 5 and 10 years in all cohorts, following the same procedures as in the baseline examination. 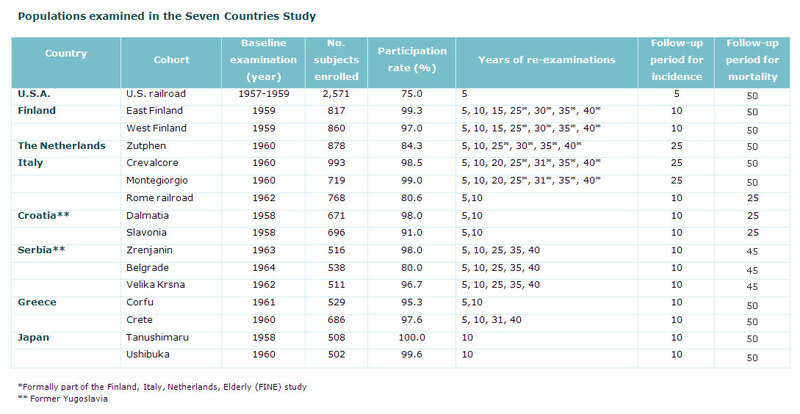 The re-examination surveys after 5 and 10 years were part of the basic protocol performed in all cohorts, except for the 5-year anniversary in Japan and the 10-year anniversary in the US railroad. A systematic monitoring of non-fatal cardiovascular events took place during the first 10 years of follow-up with periodic collection of interim information on illness and death. Mortality data collection continued in all cohorts for a minimum of 25 years. Cardiovascular risk factors were also re-examined by repeat surveys of survivors in 9 European cohorts after 25, 30, 35 and 40 years follow-up. 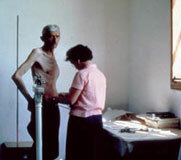 The collection of mortality data continued up to 40 years in 13 of the 16 cohorts and will be collected in them until the 50 year anniversary. For an overview of the follow-up surveys for each cohort, click on the image below.